Quadrant Engineering Plastic Products (EPP), leading global supplier of high-performance thermoplastic materials, can now add 2016 Environmental Excellence Award in Best Overall Program to its growing list of accolades. The award, presented by the International Association of Plastics Distribution (IAPD) was announced in early October at the IAPD’s annual convention in Phoenix, Arizona, where the association celebrated its 60th anniversary. IAPD’s Environmental Excellence Awards recognize accomplishments of companies in the development of environmentally friendly materials and the manufacture of plastics in an environmentally responsible manner. The award for Best Overall Program went to Quadrant EPP for identifying opportunities and initiatives that reduce waste and energy consumption while increasing its global product offerings. 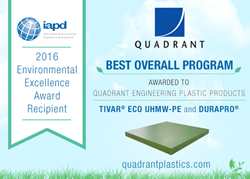 Quadrant EPP recently made a multi-million dollar investment in its Scranton, PA facility and introduced two ECO (recyclable) grades of performance plastics: TIVAR® ECO UHMW-PE and DURPRO™. The company also instituted an aggressive postconsumer buy-back program. Sustainability measures are important to Quadrant EPP because the company supports the idea of KAITEKI—a concept led by parent company, Mitsubishi Chemical Holdings Group (MCHG). KAITEKI represents “a sustainable condition which is comfortable for people, society and the Earth, transcending time and generations.” Japanese for “comfort,” KAITEKI defines the long-term direction of MCHG, aiming to balance three core management dimensions: economics, technology, and sustainability. The approach of both Quadrant EPP and MCHG is to develop sustainable systems that solve business, environmental, and social issues in coexistence with the planet. Learn more about Quadrant EPP’s ECO (recyclable) grades of performance plastics at http://plasticperspectives.com/quadrants-commitment-to-sustainability-eco-grade-performance-plastics/.